Here’s me as a dazzling blonde in my favourite sheep jumper at some point in the 80s. 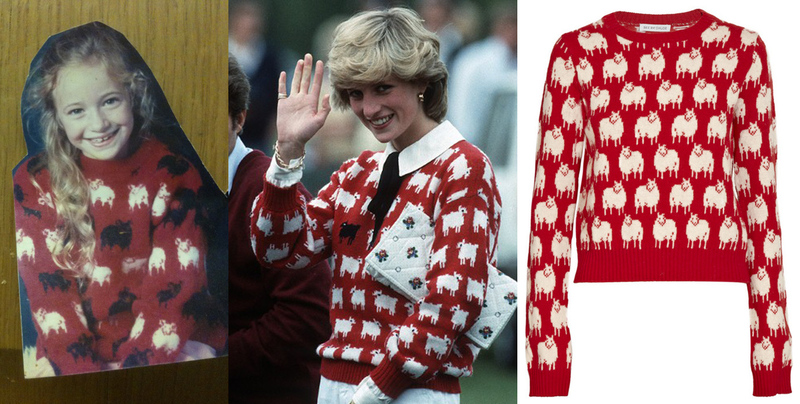 Princess Diana wore something very similar in 1983, but I don’t think my mam knitted mine in homage – she’s not a royalist by any stretch of the imagination. I imagine Woman was stuffed full of Di-inspired knitting patterns at the time though, so perhaps that’s where she found it. I was obsessed with sheep at this stage in my life so it was a very thoughtful gift. Finally, here’s the See by Chloe sheep jumper which everyone went bananas for last Christmas. Funny how things turn out, I’d kil for my sheepy sweater now.